Welcome to our site. The reason we are creating Monero mining rig today is because the Ethereum mining difficulty is skyrocketing by the day and it might be hard to get your desired profits. Luckily, with the best monero mining hardware, you are guaranteed good returns. This article is about building a very affordable 8 GPU Monero mining rig without compromising on the quality of the hardware. When building mining rigs, you don’t have to go for the most expensive hardware. You just need to know the features that each should have. We are going to need a motherboard, mining monero gpu, SSD, CPU, PSU, etc. And, being an 8 GPU Monero mining rig, we are going to use AMD Graphics Cards as they give the best hashrates compared to Nvidia. If you are looking for the best GPUs for monero mining, my recommendation is AMD RX 580 or AMD RX 480 as they both give great hashrates. Mining monero with gpu is the way to go. Note: The AMD RX 480 power consumption is 150W while the AMD RX 580 consumes 185W. What is the best Graphics Cards for mining Monero? Since we are building an 8GPU Monero mining rig, you will need 8 of these GPUs. The point is to get the best monero mining gpu. You can use both (4 Rx 580 and 4 Rx 480) or just go for one of them as long as they are 8. This helps when you cannot find all similar GPUs because at times they are out of stock. Also, before checking anywhere else, I would recommend you start with Amazon because they do sell GPUs and at an affordable price. The only difference between them is on power consumption because they both produce 700H/s when mining XMR. When using 8 GPU for mining monero, you will get a total of 5600 H/s. And, the best part of creating your own monero mining rig is that you can always resell the GPUs once you’re done with monero gpu mining, and at a profit. What is the best GPU Risers for mining Monero? The recommended way of attaching the GPU to your motherboard is by using RISERS. They are pretty easy to use. The first thing you want to confirm is if your motherboard can support all the 8 risers. Just check if it has 8 PCIe slots where you will attach the risers. What is the best Motherboard for mining Monero? As I mentioned above, your motherboard must have 8 PCle slots to support the 8 GPU risers. This motherboard by ASUS is the best as it has 7 PCI-E slots plus 2m.2slots to allow you to extend 2 more PCI-E slots. Thus, this motherboard supports a total of 9 PCI-E slots so we will be able to attach all the 8 GPUs and have one PCI-E slot to attach the storage drive. Again, the motherboard also supports Intel Processor and DDR4 RAM and it’s very affordable and durable compared to other options. What is the best memory card for mining Monero? Since our motherboard supports DDR4 RAM, there is no harm in using a DDR4 4GB RAM instead of an 8GB since RAM won’t affect our mining efficiency. What is the best Processor for mining Monero? Remember that I mentioned that the above motherboard supports Intel LGA 1151, then we will go with Intel Celeron for a processor. Since we are creating a GPU mining rig, there is not point of going for the high-end processors. Celeron is enough to help us achieve our goal and at a lower price. All we need our processor to do is boot up our mining rig then run the mining software. What is the best computer storage for mining Monero? We are going to need a storage and my recommendation is SSD drives since they are faster compared to HDD. Again, I like that with SSD drives, I can stat mining within a short time of booting up my rig whereas with HDD you wait for a long time. Also, when building a first mining rig, one has to reboot severally which can be so frustrating with slower drivers. However, SSD drives are more expensive than HDD, but their speed of performance and the fact that you will be good with 120GB space instead of 500GB justifies the price difference. And, SSD drives consume less power compared to HDD so in the end, you will have more profits. What is the best PSU for mining Monero? To avoid frying your monero mining rig, invest in a good power supply unit. The best PSU should have enough power supply as needed since GPU’s consume a lot of power. In our case here, we will need two of these power supply units. If you go with the AMD RX 580 GPUs, 8 of them will consume 1480W since one consumes 185W. And, don’t forget that the other components too will consume some power, say 250W. Therefore, to be on the safe side, have at least 2 PSU with 1000W supply capacity. What is the best Adapter cable for mining Monero? Since we are using two power supply units and running them simultaneously, we will need adapter cables. They are very affordable and they work by attaching to the motherboard and the PSUs. And, since we want to cut on every cost, I’d advise you buy it when buying your PSUs to cut on shipping cost. To boot up the monero mining rig, you will need an on/off power button. These power cables come in handy and they are very affordable. What is the best Mining Frame for mining Monero? Finally, to complete your mining rig, you will need a properly ventilated open air frame case. Alternatively, you can build yours and save some good amount. 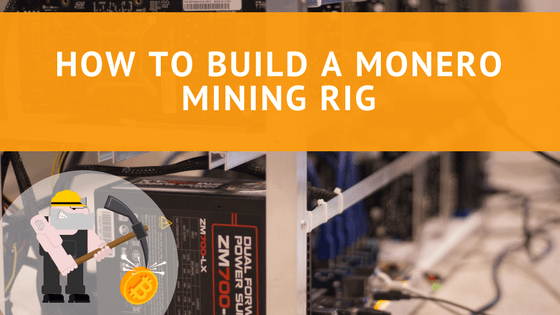 Final considerations for those looking to build their first Monero Mining Rig or for those who have a Monero Mining Rig already and want to take it to the next level! If you are looking for a cryprocurrency that has a lower difficulty, monero is the best choice. Whether you choose to invest or mine, either way you are guaranteed some good returns given that the prices are on the rise. Next articleCan You Mine Cryptocurrency on Your Mobile Phone?